I went down to Richmond this weekend to participate in the McDonald’s Half-Marathon. I signed up for it a month ago figuring I love running and I love McDonald’s, so why not? Unfortunately, I had been too idealistic because there were no McDonald’s coupons in my race packet and I had neglected to train for the race. So, I woke up at 7 a.m. on Saturday completely unprepared and made my way to the starting line praying that my body would miraculously compensate for the lack of training. I was doing everything I could during the 13.1 miles to keep my mind off the pain of running when I started brainstorming for my blog (I have no explanation for the things that cross my mind when I run). I decided that I’d like to add a “Priceless Sunday” edition dedicated to the things in life you can’t put a price on (think of that one credit card commercial). Since Sunday is considered by many a non-working day or day of rest, I found it appropriate that Sundays be set aside for the lessons that money can’t buy. This blog decision occurred right before I hit a figurative wall at mile seven. I guess since the longest run I’ve done in the last couple months has been seven miles, my body knew exactly when to start shutting down. I ran the next six miles with the chills, nausea, and feeling like my running shoes suddenly turned into 20 pound bricks. At this point the only thoughts that ran through my head were how much I hated running and myself for letting this happen. Finally, I spotted the finish. I was more comforted by the ambulances waiting there then I was the actual finish line and people cheering. 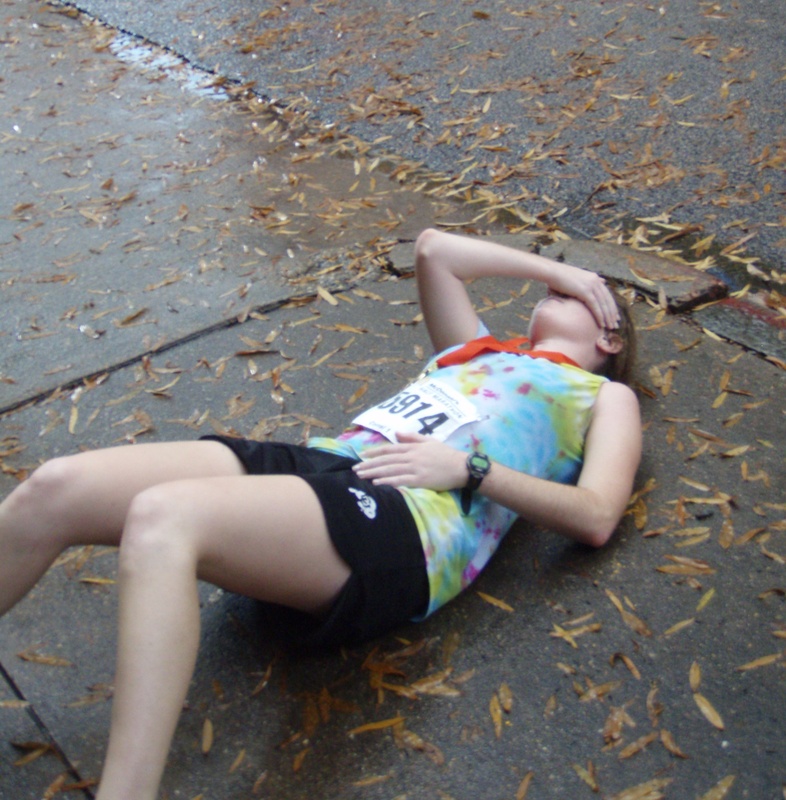 When I dragged myself across the finish, I found a secluded spot on the sidewalk so I could curl up in a ball and erase the memories of the most painful race I’ve done. Eventually the endorphins kicked in and I was able to see the race in a more positive light even though I was unable to walk properly. wow tina. only you could do that without training for it. you are a beast. i totally understand why you did not want to go out the next day. and only you would pay 80 dollars to put yourself through such AGONY. Oh, and I love this Sunday idea. Bravo/Brilliant/Beautiful. Hahah. I know that feeling. Felt it during my 10k. At least you made it. I saw many who NEVER did. Straight death. I like this Sunday idea, there is a lot you could do with it- especially since Sunday Shows are completely free and usually the highlight of my (our) weekend. If you think about it though, Sundays need to be priceless to make up for all the money spent Friday and Saturday on cheesy bread, veggie pitas, joose, and cabs. Tina, this is brilliant! You are such a good writer/runner/roommate/friend/idea-thinker-upper/couch-sharer/turtle-owner. And I do think Sunday Shows need to make an appearance in here somewhere, because they are divine and don’t cost a dime. Holla. Races are waaayyy to expensive. There should be student discounts or something. After reading I completely know how you felt when you were running, well almost. I used to get the horrible hitting wall feeling during XC at like mile two, kudos to you for making it to the 7th mile and managing to finish! And I love the “Priceless Sunday” idea! YOU PAID $80 to run in a race sponsored by McDonald’s? There is so much wrong with the fact that didnt receive any coupons, and I find it highly ironic that one the companies most responsible for WORLDWIDE fatness sponsors a half-marathon, perhaps they could do more for the world if they sponsored a full one…hahah. At least I know you are prepared for the turkey trot. Try bringing your ipod, that always helps keep my mind off of running. You could even buy an audio book for long races. There’s something about putting McDonald’s and distance running together that makes me feel a little sick, and i haven’t ran a half marathon either.